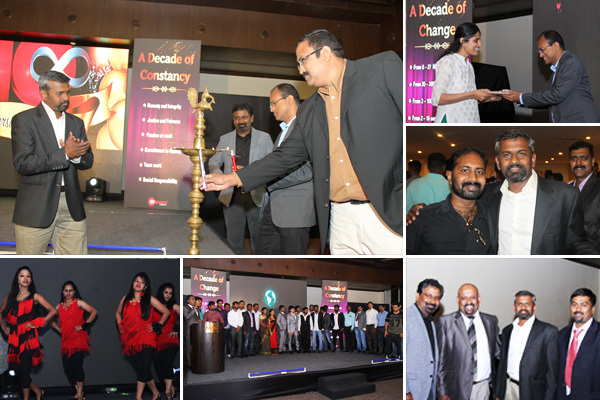 Flatworld Solutions successfully completed its 10 years of operations, and celebrated the milestone 10th anniversary on 23rd April in Mac Sterling Hotel, Bangalore. 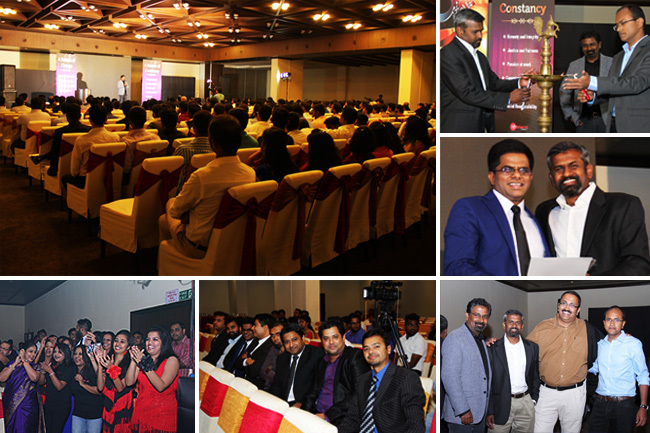 Company’s 10th anniversary is certainly a milestone worth celebrating, and Flatworld Solutions did it with élan! Founded in 2002 and incorporated in 2006, Flatworld Solutions has come a long way – from offering a handful of services to dealing in 18 different verticals today, Flatworld has been expanding possibilities not only for its clients and partners, but also empowering employees all through its commendable journey. Celebrations started a month in advance with the weekly email announcements from the HR team, which build up the curiosity, fun, and excitement for the main event. To mark this special milestone, a “10 Year Logo Designing Competition” was held, which got tremendous response and enthusiastic participation from all employees. Jalandhara Reddy from the Creative Services team won the competition, and his entry was unanimously selected as the official logo for the 10th Year anniversary, which graced all the event-related banners, emails, and hoardings. On 23rd April at the Sterling Mac Hotel, the function commenced sharp at 5PM with a welcome address by Mrs. Nancy Seby, followed by the National Anthem, prayer by Mr. Israel Paul, lamp lighting by the directors, and a welcome dance. Audience were then treated to the words of wisdom from our esteemed board of directors (Jacob William - President and Group CEO, David Antony - CEO, Business Solutions, Anand Mathew - CEO, Global Shared Services, and Seby Kallarakkal, Director), who spoke about Flatworld’s journey over the years, the way it’s headed into the future, and the contribution of employees in making this company one of the most successful companies in such a short span of time. Next came the moment when the employees were awarded for their persistence, hard work, and association with Flatworld. Certificates and souvenirs (in the form of Gold and Silver Coins) were presented to the employees who have been a part of the Flatworld journey for over 9, 5 and 3 years respectively. The evening ended on a high note with electrifying cultural performances and photo sessions, followed by a sumptuous dinner. Flatworld Solutions (FWS) is a global corporation offering solutions in IT, Business Consulting and Outsourcing Services. Founded in 2002 and incorporated in 2006 with the single-minded purpose of using technology to equip and enable businesses build efficiency, negate global distances, save time and increase bottom lines worldwide, Flatworld has earned it stripes with a decade of satisfying experiences. Over 9000 customers and millions of dollars in increased client revenue, over 2000 efficient and enabled employees with a solution centric leadership all tell the story - a story of expanding possibilities.